Learn Italian this summer in Lignano Italy . Lignano Sabbiadoro ("Golden Sand") developed in the early 20th century from some hospitality resorts which originally were reachable only by sea. The first inhabitants came in 1931, after the draining of the nearby marshes, the first road with the nearby commune of Latisana being built in 1926. Lignano Sabbiadoro, is now a young city full of various entertainments it is an important tourist center of the region Friuli Venezia Giulia, which is surrounded in the North by the Alps and the border with Austria, in the South by the Adriatic coast and on the East by the border with Slovenia. The flight line of the region from the sea to the mountains, from the east to the west is not longer than 100 km and the modern motorway net makes the distances even shorter. Lignano is situated on the peninsula washed by the Adriatic seacoast, with the oasis of the WWF of the lagoon of Marano behind. 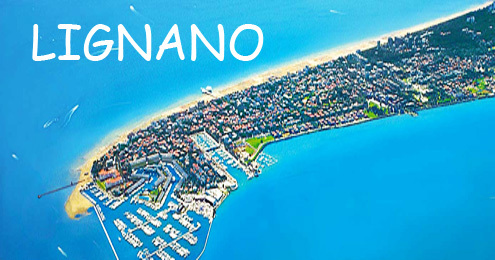 Since many years on the lagoon Marano blows the "blue flag Europe’s", the symbol of cleanness of beaches, sea water, air and environment of the ports. The characteristic peculiarity of Lignano, as one can infer from its name, is the finest sand on the 8 kilometer long beach, which seems to reflect the warm gold colors of the sun. In Lignano there is also one of the most impressive and biggest beach stadiums in Italy.